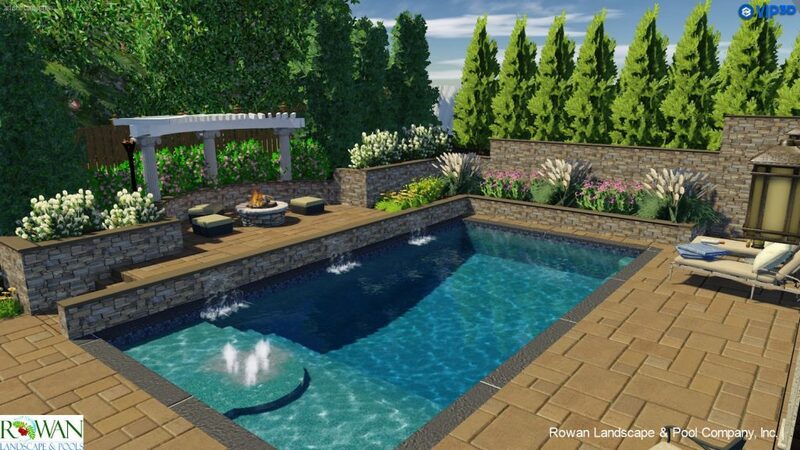 Rowan Landscape & Pools uses sophisticated design software to transform outdoor living dreams into reality. When designer Tim Rowan sits down with a client to plan the perfect poolscape, he literally leaves nothing to the imagination. Tim, the president of the 36-year-old landscape/poolscape company outside Baltimore, Maryland that bears his name, uses a combination of skillful salesmanship and sophisticated 3-D software to show clients exactly how he will translate their dreams into reality, right down to the soft splashing of the waterfalls, the gentle blowing of the breeze and the crackling of the flames in the fire features. His techniques, which earned the family-owned and -operated company a 2017 EDGE Marketing Award from the Master Pools Guild, have not only boosted sales but also sales figures. For years, Rowan Landscape & Pools has been presenting clients with DynaScape CAD drawings. The Structure Studios Vip3D software program takes its designs to the next level. For this project, shown in photos and a 3-D screen shot, Rowan Landscape & Pools designed and installed a formal pool that included three sheer descents, an air bar, foam jets, glass tile and ledger stone. Once the CAD drawings are approved, Tim’s wife, Beth, in a process that’s akin to building a virtual doll house, spends four to six hours creating a two- to three-minute 3-D video of the poolscape using Structure Studios landscape software. When Beth creates a video, she incorporates the house and property elevations. She also adds furniture and creates entertainment spaces and shows views during the day and at night. With Structure Studios, she can even include animated figures splashing in the water, diving into the pool and tossing beach balls to each other. Indeed, one of Tim’s clients was so taken with the fact that Beth had outfitted the virtual bar with a bottle of wine that he said “sold” before he got to the end of the video. In another case, Tim used the video to show clients what it would be like to swim by a waterfall or under a bridge and what the pool looked like from under the water. Rowan Landscape & Pools designed and installed this free-form pool and spa combination that features a beach area with a swim-up sunken tiki bar. The photo and 3-D screen shot are virtually identical. If the client wants to make changes to the 3-D design or get a different view, this can easily be done. The 3-D video is presented to the client, who can share it with friends and relatives to get feedback. “We recently had clients who sent it to their family in China,” Tim says. Rowan Landscapes & Pools also posts the designs on YouTube and social media channels. Rowan Landscape & Pools is a proud member of the Master Pools Guild. For additional resources, visit www.masterpoolsguild.com.